Figure 3-7.--No. 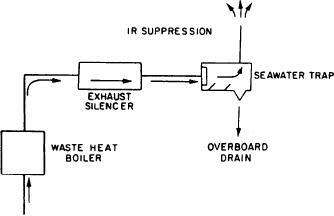 3 exhaust configuration. automatically based on the enclosure temperature. fire stop, which is described later in this chapter. ALTERNATE source is one of the other SWBDs. no separate fan controller is used. of the ship by other vessels and aircraft. the location of the green water (seawater) trap. ducts. The exhaust ducts from the No. 1 and No. in the tank and drained overboard.